Small-town boy. Gypsy girl. Desert Summer. 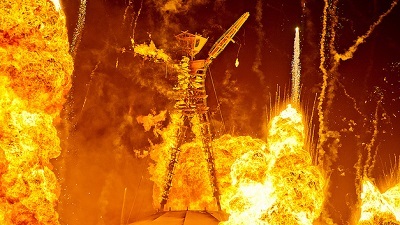 However, Burning was less about getting one's freak on in the middle of a bunch of crazies, and more about two people who've managed to collide during a time when both are at an important fork in the road of their lives. There it was - all our lives, everything we knew, just days from becoming a ghost town, a memory, a graveyard. Ben is suffocating and wants nothing more than to start life over, yet he carries the guilt of what he's about to leave behind. His bags are packed for UCSD and he's almost out the door. But how can he say goodbye to a family who needs him and a town which will soon cease to exist after he's gone? I'm not the kind of guy who believes in things. Lala has her life planned out for her. Coming from a traditional Roma family, she is on track to marry young and raise a family. Thoughts of freedom seem like nothing more than a fantasy meant for other people. Could she dare to wonder if there was more to life outside of her bubble? I was marked, and not for this. If you end up reading Burning, you might find yourself surprised at how I was able to appreciate a book with such an immediate and intense love story. And I could see why you'd think that. But if you keep reading, you'll slowly start to see where the author is taking us. There's a reason for all of this thick (I felt like I was on a constant balancing scale going back and forth from beautiful and deep, to just plain silly) emotion. How do you show character growth if the characters are never allow to fall or never allowed to make mistakes? Yes, the love story was very "beat-you-over-the-head" with extreme wanting. But this time, it actually worked for me when I took a moment to look at the bigger picture and where the characters were headed. "Don't you feel it too, Lala?" 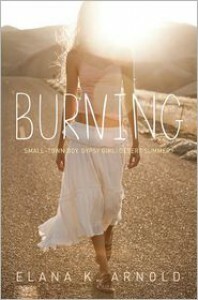 The character growth in Burning went far beyond the confines of a love story - there were themes of self-acceptance and learning to let go of people when the time came for them to stand on their own. The secondary story between Ben and his brother was so beautifully handled. Ben had always known that James was different but hadn't quite crossed the bridge from acknowledgement over to acceptance. Love can be tough. When you want to protect a person who means the world to you, it hurts to have to let a person fight their own battles. The biggest underlying current running through the book extends beyond love, trust, or letting go of the past. Over and over, you spot glimpses of the word freedom - freedom from fear, freedom from small-town life, freedom from guilt, and freedom from what's expected of you. This is what we're seeking knowledge of, and what the characters both desperately need. Is the freedom to be found in each other, or are they needing to travel their own paths? I learned a few new things about isolated parts of the Romany culture, which sent me to the internet to look up a few questions left unanswered. There is a difference between the terms Rom/Romany/Romani and Gypsy, although both are used in this book. There are also significant differences between groups of gypsy people, depending on their heritage and their chosen set of life principles that they follow. I'm glad I went and did some searching around because at first I didn't understand why in this story, Lala's preference for long skirts had to do with a core belief of being unclean. Even though I've read books with Romany characters before, some of the instances in this book were new to me. And the "as seen on t.v. Gypsy" lifestyle doesn't quite match up with the people represented in this particular book. Apparently, this chick won't get in trouble for not wearing a long skirt. I think I'm more concerned about her choice of date. Even though this book had a few moments of awkward yearning, I was impressed by the thoughtful reflections of the characters, and the ties which brought everyone together. The love story is unconventional, and the resolutions may come as a surprise...but those are only a couple of the reasons why I liked Burning as much as I did.